Is this because of a form of experiences-deficit during their early years? Their parents often lack the funds and time (working several jobs) to take their children to after school classes, visits to local museums and cultural events, and/or go on out-of-city and out-of-state trips. Is it due to a lack of academic rigor and vigor in their classrooms? Schools with a higher number of students living in poverty tend to do more grill and drill in an effort to raise their test scores. My personal belief is that grill and drill does not translate into academic vigor and rigor. Do the teachers have lower expectations for the students given their backgrounds? Do their parents have different expectations for their children in terms of academic achievement and college attendance? I witnessed a conversation between my students yesterday that I found surprising and further had me wondering about the questions I posed above. In one of my schools, where I serve a class of 4th though 6th graders, I have three students from one of the 5th grades and another three students from the other 5th grade. One of the 5th grades has a teacher who is friendly with the students and does fun things in class with the students like showing them clips from major sports events. The other 5th grade class has a very strict teacher. She has a strict and rigorous class schedule and demands that the students work hard in her class. Personally, I like him better. He is friendly to me and often checks in with me about how the students are doing. She is not friendly with me, never checks in with me. I assumed that the students would also like him better and rave about him as a teacher. Yesterday, the kids started talking about the two teachers. One of the 6th grade boys, who had the nice guy teacher last year, had this to say, “I had Mr. Nice Guy as a teacher last year. If you want a friend, then Mr. Nice Guy is the best class but if you want a teacher, then Ms. Strict and Rigorous is the best class. I didn’t learn a single thing in my entire 5th grade year with him.” It was a short conversation as I don’t talk about teachers with the students and directed them to their computer assignments. But it was a huge shock to me. I really expected the kids to rave about Mr. Nice Guy during this conversation. I shouldn’t be that surprised. Students often know what it is best for them but sometimes have trouble expressing it. This 6th grader (who, by the way, is far from compliant – way too often talking to his male friends about sports during our class activities) is very articulate so he was able to clearly express his needs. What did surprise me, though, is that his need to learn is stronger than his need for fun and relationship with the teacher. So even with what some might classify as having some disadvantages, he still recognizes the importance of learning. I went to Google to explore the topic of what students want in their classes and from their teachers. Most of the posts and articles were from educators – not from the students, themselves. So even though I think I know what students want, I may not. What I did re-realize, though, is that what I can do as an educator is keep the lines of communication open with my students, continually inviting them to give me feedback about our learning activities, facilitating conversations about what they are actually learning. I had the opportunity to facilitate a workshop on design thinking for educators at the New Mexico Association for the Gifted Fall Institute. Here is a round-up of what we did. Participants were asked to warm-up for the session with a challenge from the Destination Imagination Instant Challenge App. I then had the participating educators familiarize themselves with Squishy Circuits to prepare them for the upcoming design challenge and to deepen their engagement with the workshop content. The following videos and graphics about design thinking were introduced and discussed with participants. Design thinking was introduced to the participating educators through showing them John Spencer‘s video. The following graphic, which I created for this workshop, was discussed. Design Thinking Process and UDL Planning Tool for STEM, STEAM, Maker Education developed by Barbara Bray and me was then introduced to the participants. The major challenge or task was to create a design using Squishy circuits based on a partner’s specifications. Only the designer could touch the materials not the “client” who verbally described her desired design. To further explain this challenge, I showed a video of my gifted elementary students engaged in the challenge.
. . . and some photos of the participating educators doing this challenge. One of the partner teams was one of my colleagues, Anna, an amazing art teacher, who was the client paired with a gifted ed teacher, the designer. Anna provided the verbal directions for her partner to make an elephant drinking water. We were reaching the end of the session without its completion. I told them to just let it go – the elephant was complete but the lighting was not. During the time that the workshop participants were walking around looking at one another’s creations, Anna and her partner completed the elephant using the LEDs to light up his eyes. The look of pride and empowerment in both Anna and her partner, who obviously has never completed such a project and was glowing with well-deserved pride, was priceless – touching me quite deeply. The moral of the story for me: Teachers should be provided with PD opportunities to deeply engage in learning to the point where they feel empowered. I believe this will help increase the transfer of learning to their own classrooms as they will want their own learners to feel that same sense of empowerment. I had the opportunity the learn about Dr. Reuven Feuerstein through Dr. Yvette Jackson at a National Urban Alliance conference almost 20 years ago. The biggest thing I took from the conference, that remains with me today, is that student potential assumes there is a limit, cap, or ceiling as to what can be learned. If students are perceived as having a propensity for learning, there is no cap. The apropos cliche becomes the sky is the limit. Human beings have the unique characteristic of being able to modify themselves no matter how they start out. Even in born barriers and traumas can be overcome with belief and the right mediation. Most school settings focus on students’ deficiencies. If educators take the perspective that their students have a propensity for learning, then their focus becomes identifying and working with their strengths and prior knowledge. It is through accessing prior knowledge and student strengths that deficiencies can be addressed. For the past several decades, I have had my feet in both elementary education and teacher training and development. Regardless of age, grade level, and setting, I include hands-on and experiential learning as a integral part of my instruction. It is learning by doing with a reflective element which, in turn, creates conditions for deeply engaged learning. One of my favorite expressions is “Insanity is doing the same thing over and over again and expecting different results.” There’s lots of lip service about closing the achievement gap, serving marginalized populations, helping students gain 21st century skills, and preparing students for STEM-related careers. The problem is that the school systems working toward these changes are using a factory model of education prevalent in the 19th and 20th centuries to do so. The changes that are being sought are not coming into fruition as different outcomes are expected out of doing more of the same thing. 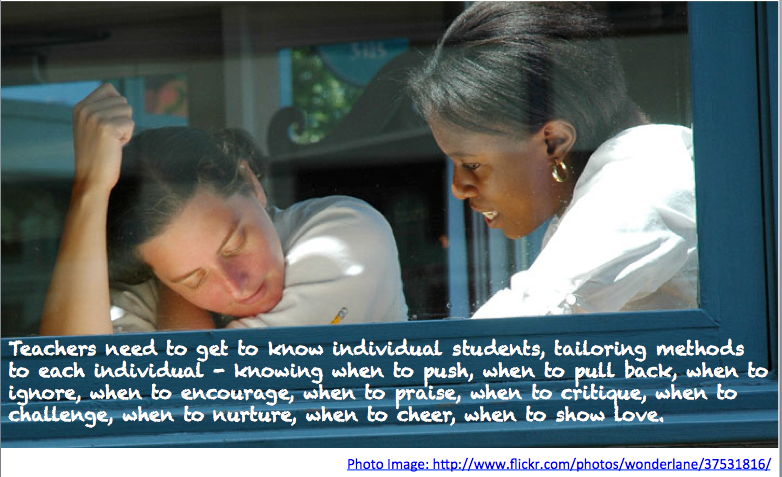 This is why I titled this post, The Imperative of Experiential and Hands On Learning. I believe that current instructional strategies need to be turned on their heads to achieve desired results and outcomes. Hands-on and experiential learning is used in some elementary schools but this diminishes as students get older. In too many high schools and colleges, instruction seems to occur through engaging the ears and sometimes the eyes (through visuals such as with slide presentations). Interestingly, though, a Study Finds 52% of U.S. Adults Say No. 1 Way to Learn is Through Active Participation, Followed by Visual Demonstration. Engages most of the senses. More likely to engage emotions. Making mistakes becomes a natural part of the learning process. Hands-on learning is often lots of fun; and having fun increases engagement and motivation. Hands-on and experiential learning often is multi-sensory learning often engaging sight, hearing, tactile kinesthetic senses as learners participate in the educational activities. Experiential learning takes data and concepts and makes them “real” by applying them to hands-on tasks, with real results. As the student interacts with the information, it becomes real to them. I often mention that one of the roles of the educator is that of an ethnographer. Loosely defined, . . .
Monica took a teaching methods with me where the class project was to develop a curriculum unit. I believe and practice mastery learning. This means students can make revisions and resubmissions when their work does not meet project expectations and criteria. She worked on the changes I suggested. Upon a second review, it was still B work, but I knew how hard she worked. I basically said to myself, “She worked quite hard, to the best of her ability,” so I granted her an A for this winter intersession course. It was the beginning of Winter term. I was walking past the dorms. Monica came out into the second floor balcony with a paper, her grades, in hand. She exuberantly yelled to me, “Jackie, I got an A in class. It is the first A I have gotten in college.” The look of joy on her face was priceless. Don’t get me wrong. It is not about giving students A’s to raise their self-esteem. Sometimes the human-humane process is to push a student to his or her limits. Andrew, a 25 year-old, was a Teach for America student in the Master’s of Education program where I was teaching. He received a Bachelor’s degree from an Ivy league school, and came to New Mexico for the programs. For the curriculum class I was teaching, students were asked to create artifacts for their classroom – no paper nor tests. Andrew handed in his first project. It was sloppy and lacked a professional presentation. He received the equivalent to a C. He came up to me after class to talk about his grade. I provided additional feedback the problems with his work. He began to cry explaining that he always earned A’s for his work but also emphasized that his education, thus far, consisted of taking tests and writing papers. To this I responded that I understood, but that I would continue to push him to improve the quality of his projects. His work got better and at the end of the course he told me that as difficult as it was, he appreciated how I challenged him.